With its signature stack of three buns and two beef patties covered in special sauce, there are few fast food items as famous as the Big Mac. That’s why over the years McDonald’s has tried to protect its flagship burger by pursuing legal action against any possible imitators. One of the company’s latest targets was Supermac’s, an Irish chain that sold a suspiciously similar sandwich called the Mighty Mac. Unfortunately for McDonald’s, though, this particular case didn’t go exactly as planned. Not only did a European Union court allow Supermac’s to continue selling the Mighty Mac, but it also revoked McDonald’s EU trademark for the Big Mac. 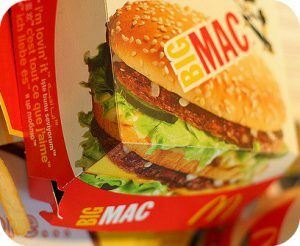 Do you think the EU court was right to revoke McDonald’s Big Mac trademark? Why or why not? Why does McDonald’s pursue legal action against supposed imitators like Supermac’s? Sources: “McDonald’s Loses ‘Big Mac’ Trademark Case to Irish Chain Supermac’s,” Reuters, January 15, 2019; Taylor Telford, “McDonald’s Loses Big Mac Trademark. Burger King Adds ‘Like a Big Mac, but Actually Big.’” The Washington Post, February 11, 2019. Photo by Josau.